This well-designed Global 15cm Flexible Utility Knife may just be the only knife you'll ever need. Its flexible design can handle everything from carving and deboning meat to chopping fruits and vegetables with total ease. The knife is made out of strong, forged stainless steel, which explains why it comes with a lifetime manufacturer's warranty. 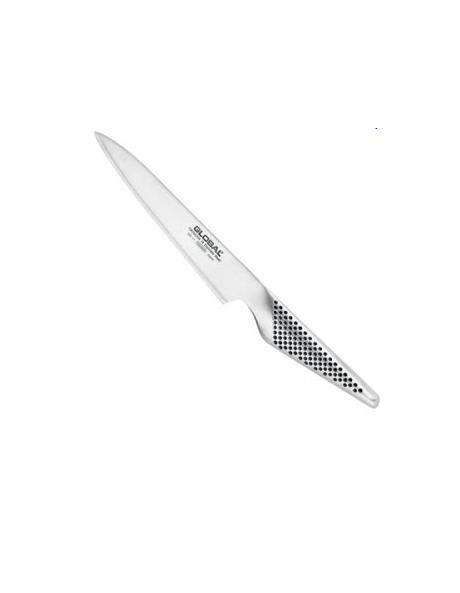 You won't have to worry about losing your grip on this exceptional Global utility knife because its hollow handle includes dimples that add sufficient amounts of friction. A seamless design ensures that no microscopic food particles go unnoticed, making for a much more hygienic food preparation experience. In addition to being versatile and unique, this flexible utility knife is a pleasure to behold.